Last January 22, 2017 (Sunday), NADA Philippines gave free ear acupuncture detoxification treatment to the members of the community of Doña Remedios Trinidad, Bulacan, upon the invitation of Robert Tiangco, head of the Damascus Foundation. Damascus Foundation Inc. was originally established in 1997 in the rural town of Doña Remedios Trinidad, Bulacan to rehabilitate and reform boys who have fallen victim of illegal drugs, solvents and other vices. Due to the needs of the community, the Foundation has also started a Feeding and Learning Center for malnourished children to nurse the children back to health and empower their families to be productive citizens. More than 50 were given treatment by volunteer ADSes. In this free community clinic, NADA Philippines met Dr. Enrique “Eric” Tayag, OIC Assistant Secretary and Spokesperson of the Department of Health (DoH) who received ear acupuncture treatment from ADS Lorie Fe Estavillo. Every year since 2010, NADA Philippines has held a regular forum where Acudetox Specialists (ADSes) join hands and share their different experiences from all over the Philippines. For this year’s activity, NADA Philippines is inviting NADA Acudetox Specialists from other countries to join us and be part of this yearly celebration of sharing and networking. 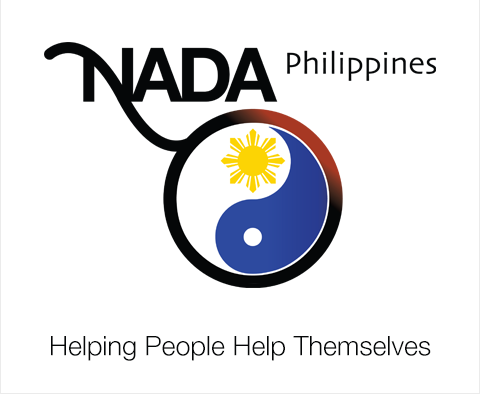 The 6th NADA Philippines Annual Forum will highlight the contribution of NADA Protocol (Ear Acupuncture) in addressing the growing problem of substance abuse in the country. It will feature international speakers who will discuss holistic interventions and approaches that addressed social issues and challenges in drug addiction and other crises. Experts from academic and clinical practices will provide background knowledge in the areas of research, addiction medicine and family counseling. Local speakers are invited to share meaningful insights and lessons in using ear acudetox amid the Philippine drug war. The forum is open to ADSes, their families, friends, and supporters of NADA Philippines. We are looking forward to your attendance/participation in this annual activity. Kindly e-mail a copy of your deposit slip to nadaphilippines@gmail.com and present the original copy at the forum registration for verification. For questions and clarifications, you may reach us at 0917-7305964, or email us at at the abovementioned address. Thank you and we are looking forward to your attendance/participation in this annual activity! University of the East Ramon Magsaysay Memorial Medical Center Inc.
Once you have made your payment, kindly email us the photo/scanned copy of your deposit slip. Further information can be found in the attached poster. If you have any other questions, you may email us at nadaphilippines@gmail.com or text us at 09333638554. Infanta, Quezon – NADA Philippines representatives conducted a training and community outreach at Infanta, Quezon in partnership with Infanta Mayor Filipina Grace R. America and Fr. Ariel Loterte, the parish priest of St. Mark’s Church. This activity, which was held from August 19 to 22, 2016, was part of the local government’s response to rehabilitate substance users who surrendered themselves for monitoring. It was made possible through the coordination of Quezon ADSes, Leticia A. Odoño and Euleny Lopez-Dee. A 15-person response team was deployed to handle the activity. The team comprised of ADSes coming from the Cordillera, Cavite, volunteer mothers from Culiat, and other areas of Metro Manila, and three documenters. Four NADA trainers facilitated the training of seven community members coming from different local government offices. The rest of the team simultaneously provided ear acupuncture treatments to substance users, elderly, children, local government officials, church members, and other members of the community. Hearing the activity from the mobilization of government representatives, locals from nearby towns such as Real, Dinahican, and General Nacar also attended the activity for treatment. On the last day, patients were already treated by the trainees from Infanta assisted by NADA representatives. Substance users who were treated reported of profuse sweating, good sleep, relief from bodily aches and pains, and having a sense of connection with other people among others. After their first treatment, they returned for their succeeding sessions with neighbors and their relatives. In addition, they also experienced renewed focus and readiness for work. At the end of the activity, the seven trainees from Infanta Quezon were certified as Acupuncture Detoxification Specialists and a total of 361 treatments were given. It also became an avenue for ADSes from various settings to learn from the Infanta experience and to share experiences with other members of the team. As the very first activity done outside Metro Manila in response to the national drug crisis, NADA Philippines takes this activity as a milestone and a model for future partnerships. Treatment area for the community outreach at Infanta, Quezon. Certificate of Recognition is awarded to Infanta Mayor Filipina Grace R. America for her efforts in forging a partnership with NADA Philippines. NADA Philippines Board President, Janet P. Paredes, with Infanta Mayor, Filipina America. Trainee studying the point locations on the ear model. ADS volunteers giving ear acupuncture treatments to surrenderees. NADA Philippines Board President Janet Paredes speaking to LGU officials of Infanta, Quezon about NADA Philippines. NADA Philippines Working Committee members with Mayor Filipina America and Vice-Mayor Noli Villamor. The newest batch of ADSes together with the volunteers and Infanta Mayor and Vice-Mayor. Batch 27 of NADA Philippines Acudetox Specialists. NADA Philippines ADS volunteers for the Infanta outreach/training came from different areas of the country. -Article written by John Joseph B. Posadas. A collection of stories and articles on the use of magnetic beads, compiled by Jo Ann Lenney of NADA USA. Jo Ann Lenney started teaching the use of ear magnets at the Lincoln Recovery Center, under the guidance of Dr. Michael Smith, NADA Founder. Dr. Smith encourages using the beads more often and documenting the cases. In British Columbia, Canada, the City of Vancouver’s notorious Downtown Eastside (DES) represents the poorest urban population in Canada. A prevalence rate of 30% for HIV and 90% for hepatitis C makes this a priority area for public-health interventions aimed at reducing the use of infected drugs. This study examined the utility of acupuncture treatment in reducing substance use in the marginalized, transient population. Acupuncture was offered on a voluntary, drop-in basis 5 days per week at two community agencies. During a 3-month period, the program generated 2,755 client visits. A reduction in overall use of substances (P=.01) was reported by subjects in addition to a decrease in intensity of withdrawal symptoms including “shakes”, stomach cramps, hallucinations, “muddle-headedness,” insomnia, muscle aches, nausea, sweating, heart palpitations, and feeling suicidal, P<.05. Acupuncture offered in the context of a community-based harm reduction model holds promise as an adjunct therapy for reduction of substance use. Last March 14, 2016, Dr. Ramon Roque nominated NADA Philippines and Ms. Janet Paredes, NADA Philippines Board President, for the Department of Health’s (DOH) search for “Heroes of Health.” Below is the nomination letter. Results will be announced this June 2016.